Hardcover, 6 x 9.25 in. / 248 pgs / 64 color / 30 bw. A leading practitioner of Kinetic and Op art, and one of Latin America's foremost artists, the Venezuelan artist Carlos Cruz-Diez (born 1923) traveled in western Europe throughout the 1950s, absorbing Bauhaus color theory and trends in geometric abstraction, and returned to Venezuela in 1957 to help initiate the massive wave of experiment in abstract, Concrete, Op and Kinetic art that art history outside of Latin America is only just beginning to catch up with. Jesus Soto and Alejandro Otero were among Cruz-Diez's immediate contemporaries, and all three shared a concern with interplays between color and perception, which Cruz-Diez has continued to pursue in installations, environments and public sculptures. 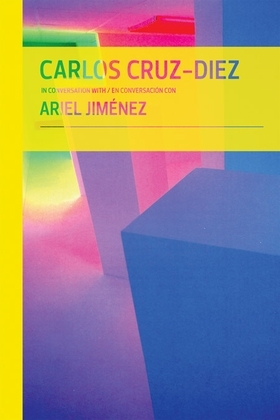 For this latest volume in the Fundación Cisneros' Conversations/Conversaciones series, Ariel Jiménez interviews Cruz-Diez about his art and career, which spans some of the most exciting transformations in the history of Latin American art. FORMAT: Hbk, 6 x 9.25 in. / 248 pgs / 64 color / 30 b&w.